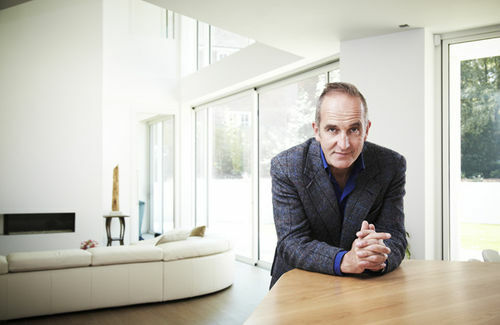 Many of you may have noticed the fire on the latest episode of Grand Designs shown last Wednesday(21st September), if not you can catch up here. 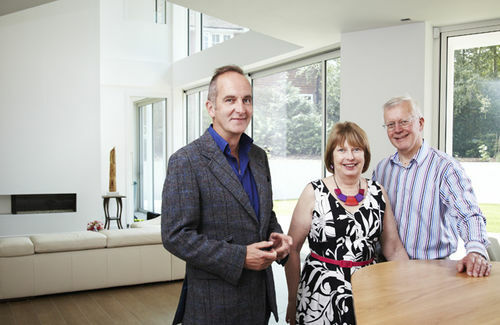 Kevin McCloud mets Paul and Penny Denby, who are demolished their mock-Georgian home on an exclusive south London estate to replace it with a contemporary mansion. The fire you can see in the background, the minimalist hole-in-the-wall style fire built into an opening with two sides exposed and a pebble fuel effect. Fires|Fireplaces|Stoves can confirm that the fire in this episode was actually none other than a Drugasar Metro 100XT balanced flue gas fire. This stunning fire is fully enclosed on two sides with the choice of either carrera pebble or log fuel effect. Shown on the program with the pebble fuel effect and the flames dancing across the top. This balanced flue gas fire develops up to 7.6kW of heat output on natural gas with a stunning efficiency of up to 70%, featuring automatic remote control as standard this fire fits perfectly with the post-modernist, contemporary style the house was built in, while also being functional with the high heat output probably more than adequate to heat the double height open living space it was situated in. Available as both a right and left-handed versions the fire can be installed in a variety of situations, particularly across the corner and one side of a feature chimney breast for that ultimate impact. Just as with the other Metro fires, the Slim Line Metro 100XT/2 uses the Vario Burner® technique that guarantees a natural flame effect and high efficiency. The unique burner divides the fire across the entire breadth and depth of the fire in a zig-zag fashion. Opt for the Cera rear wall for more dynamic flames. It's becoming increasingly popular for people to buy a woodburner to supplement or replace a gas or electric heating system because they simply can’t afford to pay their spiralling fuel bills. Changing to wood-fired heating saves many people a lot of money, but it takes time to recoup your initial investment in savings on fuel bills. The savings available vary, but these are the main points to consider when working out how much money you can save. The most obvious cost is buying the woodburner. Wood burning stoves are available to suit all budgets, but the cheapest woodburners are not the most efficient. Spending a little extra to buy a more efficient stove can be worthwhile to gain savings in fuel costs over time. 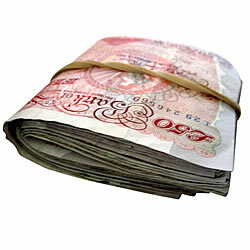 Bargain hunters tend to buy woodburners on the internet in order to get the cheapest prices. It can take a little work to compare deals properly – make sure the price advertised includes VAT and delivery, and see if there are any special deals on chimney liner or free fitting accessories with the stove. To ensure you have full manufacturers warranty cover on the woodburner, check that you are buying from an authorised retailer. 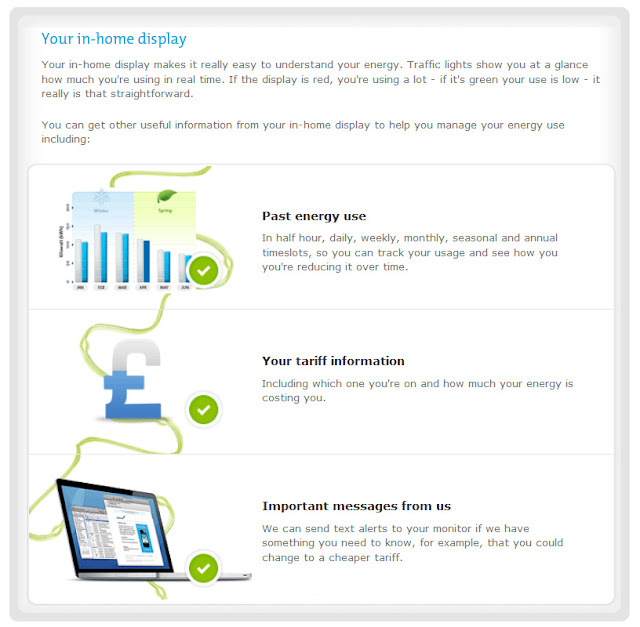 You may also need to buy a chimney liner or flue system and accessories such as a stove pipe or register plate. If you are not sure what you need, get expert advice before you buy. Installation costs vary enormously depending what work needs to be done. If you need a flue liner for your chimney or to fit a twinwall flue system because you don’t have a conventional chimney, this will increase your installation costs. Sometimes fireplaces need to be altered for a woodburner to be installed, at an extra and sometimes unexpected cost. 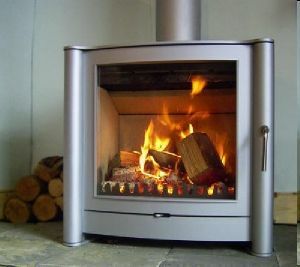 It is a good idea to have a stove installation survey from a before you buy a woodburner – this will give you a clear idea of what work is necessary and the associated costs, as well as giving you an opportunity to get expert advice about what woodburner is most suitable for your requirements. Research prices for firewood or coal both from local and nationwide suppliers, unless you are lucky enough to have a free source of firewood such as a friendly tree surgeon! To get the best prices on firewood or coal you need to buy in quantity – if you don’t already have a suitable storage area factor this into your budget as well. Demand for woodburners is increasing in the UK, but the Forestry Commission is implementing a program to develop the UK wood fuel industry over the coming years to ensure plenty of quality firewood will be available at reasonable prices. Recommended woodburner maintenance includes having your chimney swept at least once a year and an annual service of the stove by a HETAS qualified engineer – it’s a good idea to allocate some of your budget to cover these expenses. In a bid to help both customers and retailers better understand and appreciate woodland management and firewood production, Hereford based firewood producer, Certainly Wood has just launched it's first YouTube video. Entitled The Woodfuel Cycle, the four and a half minute video chronicles the journey from forest to stove and every stage in between. Commenting on the video, Managing Director Nic Snell said: "This medium provides us with the perfect way to show our customers what goes into the production of firewood and offers an insight into the sacle of our operation in jsut a few minutes. It is a brilliant way to bring the process to life. We hope the video will help those retailers who have not had a chance to visit us and better understand the process. They can also use it in their showrooms and link to it via their websites to promote the importance of burning kiln dried logs"
Certainly Wood are planning to launch more videos throughout the year focusing on specific aspects of the business. A new website that explains the science behind climate change was recently launched by Professor Sir John Beddington, The Government's Chief Scientific Adviser. The website, which can be foind at www.bis.gov.uk/go-science/climatescience presents an overview of some of the most important areas of climate science study and aims to help those wishing to get behind the day-to-day headlines to learn more about the fundamental scientific issues involved. With few areas of science having such profound implications for publuc policy and society, it is a research field not without controversy and headline hitting stories. For those uncertain about the state of scientific knowledge, the web resource explains where evidence is well established and where findings and projections remain uncertain. Sir John said " Reporting on climate change science has often created more heat than light. The evidence is compelling that climate change is happening, that human activities are the major driver and that the future risks are substantial. At the same time there is much we need to understand better; for example, the pace and extent of the changes we can expect, and regional impacts." "The fact that uncertainty exists in climate science, as it does in other fields, does not detract from the value of evidence. But an appreciation of the nature and degree of uncertainty, and of the lielihood and potential severity of risks, is critical if the science is to properly inform decision-making." The online rescource, hosted in a new section of the Government Office for Science website, explains the scientific issues, evidence and principles behind a number of key points including the contribution of human activities to climate change and how greenshouse gases actually hea the earth. Carbon Dioxide levels are now over a third higher than they were before the industrial revolution and allegedly continues to rise fast. Several independent studies show global average temperatures to be rising and many other observations such as Arctic summer sea ice extent, are said to confirm the long term warming trend. Europa Fireplaces have just released the great news thatthey have expanded their range of complete electric suites. If they don’t havethe largest selection of electric suites then it is one of the largest electricsuite ranges in the UK and with the range comes quantity and plenty of quality. Why electric suites? Well electric fires are usually 100% efficient, andusually when included as part of a complete suite they are very popular and canusually be plugged into a standard UK plug point and operated. Another majoradvantage of an electric suite is they do not require additional ventilationinto a room, and in many cases can simply be pushed up against a flat wall,plugged in and start supplying the room with instant heat, and an instant gorgeousfocal point or feature to the room. Europa Fireplaces know all this, and have put their knowledge and expertise inthe fireplace industry to exceptional use. Europa obviously understands that everyone’shome is a little different and that the individual has differing needs andexpectations from a fireplace or indeed electric fire suite. The recently unveiled Europa Fireplace electric suite range has something foreveryone, and as you can imagine therefore is a comprehensively large range ofcomplete electric suites. The stone effect that has been used within some of the suites is a MarfilMicro-marble stone effect., this stone effect has become extremely popular inrecent times and uses actual stone or marble that has been crushed, which easesin the transportation of the stone, marble or rock, that is then molded andcompressed into a desirable fireplace shape. In order to do this they have touse something to stick the pieces of stone back together, a resin is used to dothis, but surprisingly usually only 4% of the Marfil will be resin. The effectthis creates is one that is exceptionally realistic, not only to the eye, butto touch too, and because it is less expensive to transport the saving ispassed onto the consumer which allows a much cheaper RRP or SSP. The wood effect finishes have also had superb consideration and resulted in awide collection of wooden effects that range from natural effect oak, clear oakand mahogany that when married with the stylish Marfil effect, and designermodern, contemporary and traditional electric fires with suitable fuel bed effects. The overall collection of products from Europa Fireplaces is therefore one thathas supreme quality and class, which provides an ideal electric fireplacesolution for any home with a mains electric supply and raises the bar for therest of the electric fire suite manufacturers. Just a quick video to show the difference it can make using experienced, recommended fitters to install your wood burning stove. The client had seen the work we had carried out in their next door neighbours house and wanted the same in theirs. They had their builder carry out the work to the fireplace and were going to give us a call regarding installation of the stove. They had other workmen in the house at the time who said they could arrange for the stove to be fitted as they had a friend who fitted them. The client assumed that all fitters would install his appliance to the same standard but soon found this not to be the case. We were called out to tidy up the installation as the client was not happy with how it had been left........we did this and it was a good job he called us in as the register plate had been made from flammable material and also the stainless flexi liner was installed upside down.....this doesn't sound like a big deal bit it will take your liners life expectancy from 20 years down to a possible 5 due to condensation getting between the two skins causing the liner to corrode prematurely. In the end the client was delighted but unfortunately had to pay for the installation twice. He had no comeback on the installer as he was a friend of a friend and didn't want to cause upset.............the installer also wasn't HETAS Registered so there was no paperwork or notification given to building control. This would be mostly likely to render his home insurance invalid should he have had a fire caused by the stove. There's nothing more exciting for babies who've just started crawling, than exploring what's around them, whether it's a cupboard, a shoe or a staircase. And there's nothing more horrifying for a parent than seeing their little bundle of joy approaching an unprotected fireplace. That's why it's really important to make sure that your fireplace is fully protected and inaccessible for your child, no matter how fast they become. First things first, make sure that any small, loose objects, such as matches and gas keys, are well out of reach of curious little fingers. Ensure that the tools that you use for your fire, like pokers, brushes and tongs, cannot be pulled or knocked over. Invest in a good quality Fire Guard, which will be cool to touch, should your little darling escape your clutches. Before they even get to the hearth, a fireplace hearth isn't the most friendly place to be, with sharp edges and hard surfaces. To keep your child from the hearth, it could be worth using a gate to keep children away from fire, tools and hearth. But while they protect your child, they're not very attractive and might ruin the aesthetic of your romantic fire on a cold night. Therefore, if a gate isn't the look you're going for, you could try foam hearth cushions or adhesive padding, which are easily removed once a certain someone is getting its beauty sleep. Most importantly, don't leave your child unattended near a fire, whether it's burning or not - even without the flames, it's a not a good place for a small person. It's worth remembering that even if you take all these steps, fireplaces are still hazardous, however big or small you are. Think about what a fireplace might look like to you if you hadn't been in the world very long and what other measures you need to take to make it safe. After all, once you've put in the effort to make it safe, you can all enjoy the comfort and warmth that your fireplace brings. As the heating season approaches incredibly quickly, with some suppliers and fitters reporting that business is already starting to pick up as the nights get longer and cooler, we thought we'd take a look into some of the common myths and misconceptions related to fires, fireplaces and stoves. One of the most common misconceptions I hear when visiting showrooms is the question "Will I still get heat from it with a glass front?" The answer is an overwhelming yes and going with a glass fronted fire over an open fronted model. As heat rises it creates an area of low pressure and actually draws other air from the room into the fire, with an open fire this can cause a complete change of the air in the room up to 12 times an hour! meaning that a majority of the heat is being list up the chimney with an open fronted gas fire. While a glass fronted fire actually controls the airflow through the fire and up the chimeny, with fires such as the Apex Capacious HE, currently available from the Fireplace Megastore at just £529. 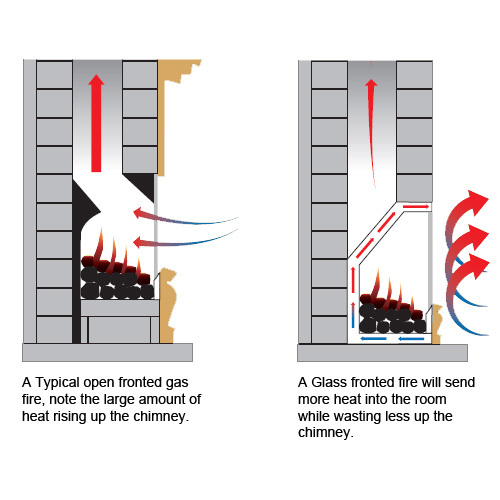 Most glass fronted gas fires also feature a convection box, this is a passage around the back of the fire for cool air to be drawn in and warmed as it passes around the fire and then circulate around the room, this helps boost the efficiency and also means you get convected heat as well as the warm radiant heat off the fire. In terms of appearance most feedback I have heard is that the glass is only really visible when the fire is off and light is reflecting off it, but when lit the glass is almost invisible and does not detract from the overall appearance as many people assume it would. One of the most common misconceptions is that because your house doesnt have a chimney (most newbuild houses don't as chimenys are actually very expensive to build) doesn't mean you can enjoy the luxury of a fireplace. If you do not have a gas supply present then places such as Fireworld have a great selection of electric suites that can be just stood up against a flat wall and plugged in to instantly give that feel of a fireplace. If you do have a gas supply you can still have a gas fire or stove in your living room, there is the option for balanced flue or powerflue gas fires, these either use natural air circulation or a high-pressure extractor fan on the outside wall to draw the exhaust gases out. When combined with a surround these can create a very realistic focal point and a great complement to existing heating. Fireplace Megastore currently have one balanced flue gas stove on special offer as well as the Apex Samson balanced flue gas fire on live display for you to experience. Many of the larger fire manufacturers will offer great, high quality fires that come with the all singing and dancing packaging and finishes. They also come with better manufacturers warranties too; a few examples of these are the Apex 5year warranty on selected gas fires, Crystal fires 5 year gas fire warranty,Pureglow 3 year warranty and the more recent Firebelly 4 year warranty on allproducts. This is a great way to entice customers to buy these products as many of themare advertised as having their warranties included as free, so you should optfor them as they are giving you added protection for less cost. Well after alittle investigation, and to be honest it doesn’t take a lot, it becomes prevalent that many manufacturers make a product and allow it to be re-branded, these re-brands will often retail for a lesser price than the branded products but don’t come with the greater warranty. I therefore wonder whether the extra cost of a branded product is actually fora better product or just for the warranty. The answer to me is obvious, but what you will need to ask yourself is “is the warranty worth the extra money?” . Firstly you need to be aware of what the warranty actually covers, and decide on whether it is actually worth having a warranty on a product you expect tolast for at least 5-10 years. Another consideration is what conditions you will have to fulfill in order for the warranty to be valid, most fire manufacturers will not honor a warranty on a fire if it has not been serviced each year by aqualified engineer and that you can provide proof that such a service has takenplace. With such consideration in mind in my humble opinion is it worth spending the extra money for a branded fire?…….Yes. I would recommend that you have all your gas products in your home whether it be a combination boiler, gas fire or stove,serviced every 12months without fail, and obviously retain proof of the service. Also, if a cheaper fire breaks down that has run out of warranty, it will probably end up costing you more to but another cheap fire then it would have cost to buy the branded version with a much longer warranty. The main reason though I would always go for the branded option with extended manufacturer’s warranty is for peace of mind, the last thing you or anyone needs is an unrepairable gas fire or stove in the living room in the middle of winter. What's an Inset Stove? well these stoves are a relatively new concept on the stove market place. Normal traditional stoves are outset, by this it means that if you wish to move an outset stove you can, the stove is not fixed into position in any other way then the flue pipe and a gas or electric connection when fueled by such sources.These traditionally designed stoves can be inset into an area, but it is usually recommended that the stove would have certain clearance distances, so although they may be inset it would only be in a open fireplace setting or into a purpose built chamber area. 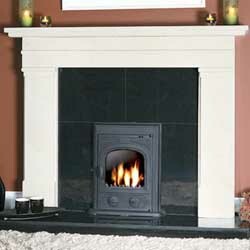 Inset stoves on the other hand are designed to be fitted into a fireplace much like a gas or electric fire would be. The front of the inset stove is visible and operational and the rest of the stove hidden in the chimney with suitable back paneling. Inset stoves are generally made from cast iron, as are most other stoves as this material proves excellent in efficiently radiating heat into a room. They can be made to look more contemporary by adding steel design or fascias and work not only by radiating heat through the cast iron or steel but by also heating the air that is then convected into the room, this makes the inset stove a very efficient way to heat the room and when in operation the stoves air circulation allows not only the fuels to be burnt, but the particles of fuel that are in the smoke are combusted once again before being expelled through the flue and out through the chimney. I hope your still with me, and not too confused, but it gets a little easier to understand from here on. Inset stoves are are in the limelight at the moment mainly due to the fact that they are extremely Eco-friendly, not only due to the great efficiency of them, and the ease to install, but because they use renewable sources to operate, like most stoves they comprehensively burn wood, as well as peat, coal, etc. and they may also be left to burn for several hours which ensures a warm room in the morning, and as the winter draws nearer we all enjoy entering a warm room on a cold morning, and knowing we're doing are bit for the environment. Anyone browsing through the current gallery brochure will come across a range of H/E (High Effiency) gas fires availble with the Pembroke, Jubilee and Lytton casts. These are a nice change from the traditional cast iron arch gas fire which is normally advertised as "decorative use only", basically meaning that a majority of the heat (and money to run the fire) is being wasted straight up the chimney and outside, not normally the aim of a gas fire indoors. The High Efficiency range combine the traditional and amazing focal point of a traditional cast iron arch with the modern glass fronted technology to offer something that not only is rustic and built from such a tangible material as iron but also offers a heat output comparable to a standard inset gas fire. There is nothing better than sitting in front of a lovely warm fire, I find that you even feel that extra bit warmer knowing that most of the heat is coming into your room and not just being wasted up the chimney. Gallery have decided to make these non internet sold items and therfore must not be sold by distance selling, this is part of a plan to allow shops to have a range of fireplaces exclusive to them and it also means that purely internet based companies cannot undercut the market. While a fireplace is often set into the framework of the house and is closed off in a way that allows you to see the flames and experience their heat, stoves offer a very different image. The stove image that comes to mind is of an enclosed and usually a raised metal structure that is often mostly closed off. Stoves, like our kitchen stove, can be cooked on, and even a stove that is solely responsible for heating does not usually offer much in the way of attractiveness, although it might be more efficient than a fireplace. The problem with stoves is that they burn their fuel, which is released into the environment, and that this fuel burning can deplete some of our natural resources. While wood is technically a renewable resource, it is not the only fuel for a stove. Some stoves run on natural gas, and others run on coal, neither of which is immediately renewable. Since these are not the best environmental choices, people interested in creating a healthy alternative worked to develop a better stove. The better stove that was developed is the biomass stove. These stoves run on natural and highly renewable fuel rather than making use of and depleting less renewable resources. While the biomass stoves still emit carbon because of the fuel that they are burning, they are at least not burning some of the resources that we have come to understand are limited in our world. The first patent for biomass stoves appeared around 20 years ago, and these stoves were designed to be supplied with wood pellets. Although technically any stove that burns wood is a biomass stove because it burns wood, a biomass fuel, the term “biomass stove” is usually reserved in modern times for the stoves that have been designed to burn wood pellets or other fuel pellets. Wood pellets are no longer the only biomass that can be burned in biomass stoves. Because of the lack of alternative fuel sources, scientists began to experiment with what they already knew. It was realized that wood burning stoves could burn hotter and more efficiently with a special system that allowed them to burn the super-dense compressed wood pellets. Further innovations have led to the question of what else we can burn for heat and even for an attractive fire. The biomass stoves became a way to replace fireplaces with a more energy efficient and therefore more environmentally healthy alternative. Even better, you may not even need to use an extensive ventilation system (like a chimney) to use a biomass stove; a small vent through the wall and up may do just fine. Biomass stoves are now designed to burn with fuels other than wood pellets. Stoves have been specifically designed to burn fuel like corn pellets, and even waste that would otherwise be wasted like cherry or olive pits. These units require a calibration, which is usually done for you and can be selected with a simple button, and they are ready to burn your bio fuel of choice. If you simply drop a handful of wood pellets into a biomass stove and try to light it, you will find that it doesn’t work. Your biomass stove is designed to make special use of energy to blow air through the fire pit in a way that allows the fuel to reach temperatures hot enough to burn. The user fills a special hopper, which feeds the pellets or pits to the fire at a regular interval. The biomass stove, once lit, provides a great deal of heat to a home, allowing you to achieve much more comfortable warmth with much less fuel, making biomass stoves a more fuel efficient alternative to other heating features in your home. The fuel is highly efficient, which means that the use of the biomass stove lets you save a great deal of money that would otherwise be wasted on firewood, gas, coal, or other energy sources. Also, because the biomass stoves are beginning to be able to run on even more energy efficient fuels, like highly renewable corn pellets, they are becoming even more positive in their impact on the environment. They save us money that we would otherwise spend on fuel, produce better heat, and put off less pollution than a traditional stove or fireplace does, and still provide us with good looks and a great source of heat.